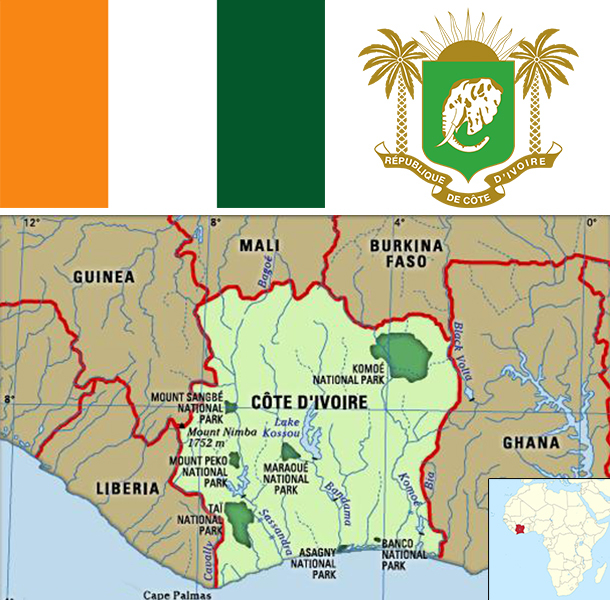 Close ties to France following independence in 1960, the development of cocoa production for export, and foreign investment all made Cote d'Ivoire one of the most prosperous of the West African states but did not protect it from political turmoil. In December 1999, a military coup - the first ever in Cote d'Ivoire's history - overthrew the government. Junta leader Robert GUEI blatantly rigged elections held in late 2000 and declared himself the winner. Popular protest forced him to step aside and brought Laurent GBAGBO into power. Ivorian dissidents and disaffected members of the military launched a failed coup attempt in September 2002 that developed into a rebellion and then a civil war. The war ended in 2003 with a cease-fire that left the country divided with the rebels holding the north, the government the south, and peacekeeping forces a buffer zone between the two. In March 2007, President GBAGBO and former New Forces rebel leader Guillaume SORO signed an agreement in which SORO joined GBAGBO's government as prime minister and the two agreed to reunite the country by dismantling the buffer zone, integrating rebel forces into the national armed forces, and holding elections. Difficulties in preparing electoral registers delayed balloting until 2010. In November 2010, Alassane Dramane OUATTARA won the presidential election over GBAGBO, but GBAGBO refused to hand over power, resulting in a five-month stand-off. In April 2011, after widespread fighting, GBAGBO was formally forced from office by armed OUATTARA supporters with the help of UN and French forces. Several thousand UN peacekeepers and several hundred French troops remain in Cote d'Ivoire to support the transition process. OUATTARA is focused on rebuilding the country's economy and infrastructure while rebuilding the security forces. GBAGBO is in The Hague awaiting trial for crimes against humanity. Cote d'Ivoire is heavily dependent on agriculture and related activities, which engage roughly two-thirds of the population. Cote d'Ivoire is the world's largest producer and exporter of cocoa beans and a significant producer and exporter of coffee and palm oil. Consequently, the economy is highly sensitive to fluctuations in international prices for these products and in climatic conditions. Cocoa, oil, and coffee are the country's top export revenue earners, but the country is also mining gold. The country boasted two offshore oil finds in 2012. Following the end of more than a decade of civil conflict in 2011, Cote d’Ivoire has experienced a boom in foreign investment and economic growth. In June 2012, the IMF and the World Bank announced $4.4 billion in debt relief for Cote d'Ivoire under the Highly Indebted Poor Countries Initiative.